Improvements in horizontal well drilling and subsurface rock fracturing technologies have greatly enhanced natural gas production in North America over the past several years. These technologies have significantly increased our known natural gas reserves in shale plays across the U.S., the largest in many ways being the Marcellus Shale. Natural gas trapped in the Marcellus Shale formation throughout southern New York, northern and western Pennsylvania, eastern Ohio, western Maryland, and most of West Virginia can now be economically recovered and marketed. 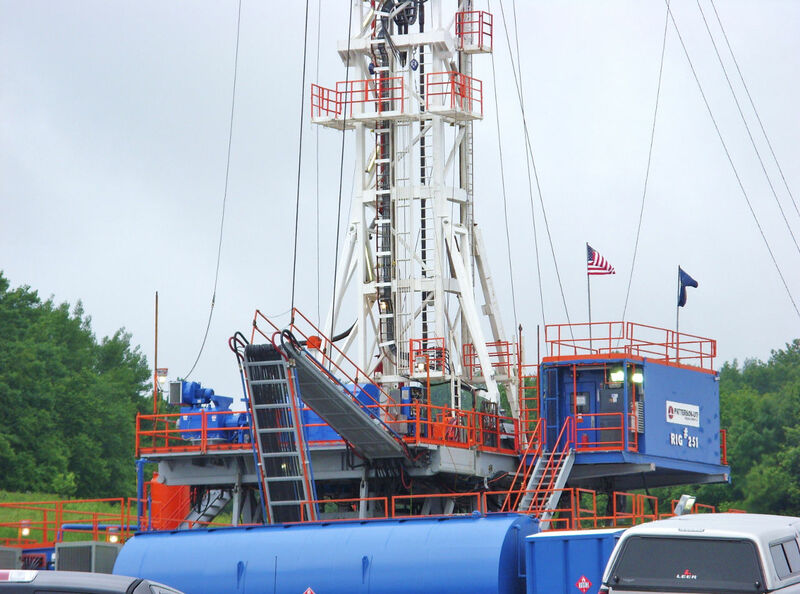 The Marcellus Shale formation serves as a good illustration for this industry boom. Jim Daley of Greenhorne & O’Mara Consulting Engineers helped Buildipedia.com investigate the basic engineering considerations of natural gas drilling and collection systems, along with the more traditional construction tasks required by this industry: surveys and stormwater management, as well as road, bridge, and pipeline construction. Natural gas trapped in shale deposits, including that in the Marcellus Shale formation, originated as prehistoric life millions of years ago. Plants and primitive animals decomposing in ancient sea beds produced natural gas that was trapped in mud layers that became shale, which is a sedimentary rock. Shale has a tight structure of small pores, and the rock must be fractured to release the natural gas trapped within it. Many of America’s marketable shale deposits are located more than a mile beneath the Earth’s surface, some as deep as 9,000' or more. The majority of wells in shale plays have shifted from being purely vertical to having a horizontal segment. Above a shale deposit, a vertical hole is drilled to below the deepest freshwater aquifer, using a well pipe with a drill bit attachment, which is then cased in steel and cemented in place. Initial drilling through the depth of any fresh water aquifers is typically performed with a rotary drill with drill cuttings forced to the surface by compressed air. Once the integrity of this initial vertical segment through the aquifer is verified, vertical drilling of the well is continued to the kickoff point further below, where the well must begin its 90 degree transition to a horizontal boring known as the lateral. Drilling of the deeper vertical and lateral borings below the fresh water aquifer is accomplished by using a hydraulic rotary drill with barite- and bentonite- (clay) infused drilling muds. Drilling muds cool the drill bit and carry drill cuttings to the surface. When all vertical and lateral portions of the natural gas well are drilled, cased, and fitted with production pipe, the lateral pipe section is perforated in sections of about 1,000' so that natural gas will have a pathway to flow into the well. Natural gas well laterals routinely extend 3,000' and now range to almost 10,000' in some cases. After the perforation of the lateral well pipe, the shale around the lateral must be fractured by using a pressurized mixture of sand, several million gallons of water, and additives to keep the sand in suspension, release the gas, and prevent iron scaling and bacterial growth. The YouTube video above graphically presents the construction process and sequence of events required to build a natural gas well. Gas production (the natural gas retrieval rate) from a well is highest at the beginning of a project, but operations remain economical for decades, following a logarithmic curve of decline until further gas production is no longer cost-effective. When wells reach a marginal rate of return, a recent industry trend in other shale plays is to refracture existing well laterals where deemed economically feasible. While a basic awareness of shale formation depth and thickness is already known, specific site information is still required to accurately plan drilling and natural gas retrieval. In addition to evaluating the uniformity and thickness of the subsoil layers being drilled through to reach a shale play, determining the extent and orientation of natural fractures in the shale is crucial to most efficiently placing the lateral portion of the well. To accomplish this, seismic testing by specialized geophysical testing firms is performed. Small explosive charges or thumper trucks create shock waves below grade throughout the site. Recording trucks or geophones capture the reflected sound waves, then computer programs generate graphics that help to identify all the necessary subsurface features required to select the best well boring locations, lateral configuration, and hydraulic fracturing strategies. During drilling, assessment of the well bore occurs during the mud logging process as collected drill cuttings are examined to record the actual conditions (for example, the type of rock or soil and soil moisture content) present at any specific well depth. Additionally, Measurement While Drilling (MWD) or Logging While Drilling (LWD) technologies are now available in which sensors are positioned behind the drill to relay the conditions present as the drill progresses. There is also a bore logging technique in which a wire line is placed into the bore with instrumentation that can record data on resistivity, sonic properties, reflectivity of a radiation source, and dimensional information. This information helps guide the well bore to and through the shale formation. It’s increasingly common for individual well pads to support multiple wells. Several of the most modern drilling rigs have the potential to walk (move laterally) across a well pad. Only about 15 feet of offset is required to drill a new vertical well boring adjacent to an existing one, with the new lateral sections of each additional well running perpendicular to the shale’s natural fractures (a desired outcome). In the plan view, multiple well laterals typically take on the appearance of a pitchfork reflected on each side of the vertical borings, with any natural shale fractures framed between adjacent well laterals. This presentation by the Penn State College of Agricultural Sciences provides more information on the Marcellus Shale formation. Pay special attention to the following: page 10, which has a map of wet and dry gas; page 30, which has a well construction and casing graphic; page 31, which shows the lateral orientation (pitchfork pattern); and page 36, which shows the production decline curve [an important aspect of this curve is a rapid production decline, accompanied by a long (decades long) production phase]. 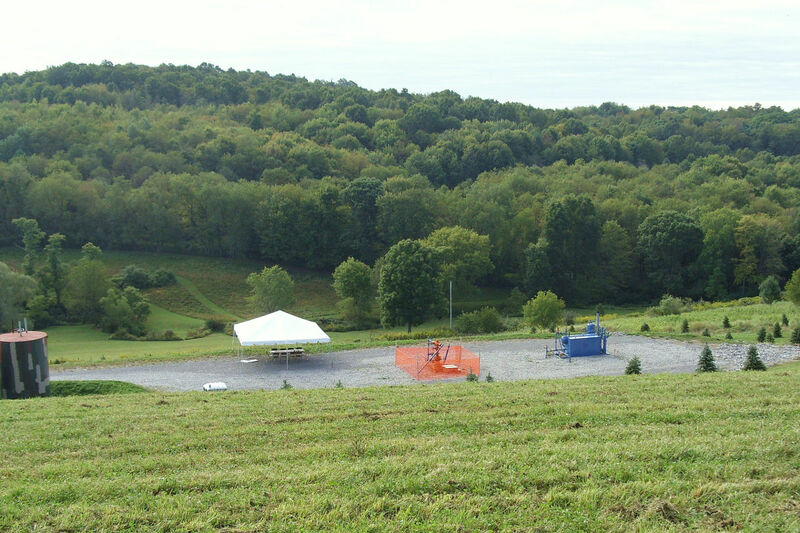 Most natural gas well pads along the Marcellus Shale deposits are about 5-8 acres in size. Mountainous or hilly terrain is present throughout most of this region, requiring engineers to design cut and fill heavy earthwork to prepare a level, stable well pad for the drill rig and associated well completion and stimulation equipment as well as site access roads. Site restoration plans, for both the interim, decades-long production phase and the final restoration phase are needed, with appropriate environmental protection features. Substantial equipment movement and associated engineering activities are required to get a well to the point of production. Drill rigs themselves are engineering marvels, and newer rigs are being customized for the Marcellus Shale. Engineers involved in designing or specifying drill rigs carefully evaluate derrick sizing and capacity and select an appropriate drill motor for the rig and depth of the formation. Derrick: Prior to drilling operations, a derrick must be stood up. The derrick is the (steel) crane and load-bearing structure that supports the drill and drill pipe over the well boring. 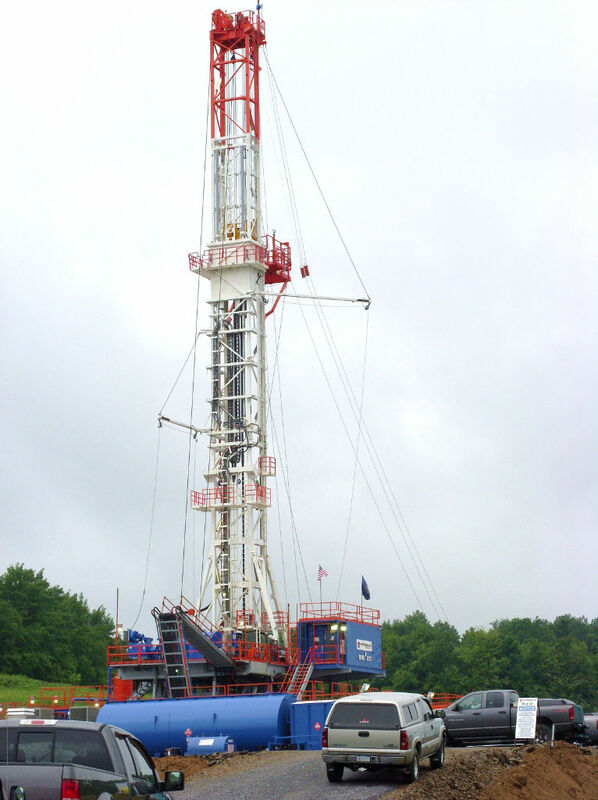 Derricks can range up to 150' for natural gas wells. They are shipped on numerous trucks in prefabricated sections and assembled on site. Drill pipe is manufactured and shipped in 30’ increments and assembled on site. Pipe stands on the derricks can be single, double, or triple stands, meaning they can hold assembled pipe segments of the basic 30', or 60', or 90', respectively. Some drill rigs and derricks have walking systems capable of moving the whole rig to a new location on the pad while 14,000' of pipe is stored in the pipe stands. Drill Motors: Drill motors must be brought in to provide enough motive force to enable a drill bit to cut a 5-8" well boring through rock formations along great distances that easily range to 12,000' (or more than 2 miles) considering the combined vertical and lateral well distances. The larger drill motors being used today develop more than 1,500 horsepower. Associated portable electric generators and cabling also need to be sized and sent to the project site – not only for drilling operations but also for area lighting and support services. The drill head for the horizontal section from the kickoff point to the end of the lateral is a turbine driven by drill mud pumped through the wellbore. Site Restoration: A completed well pad in the production phase of gas retrieval is typically reduced to about a 1-acre site. 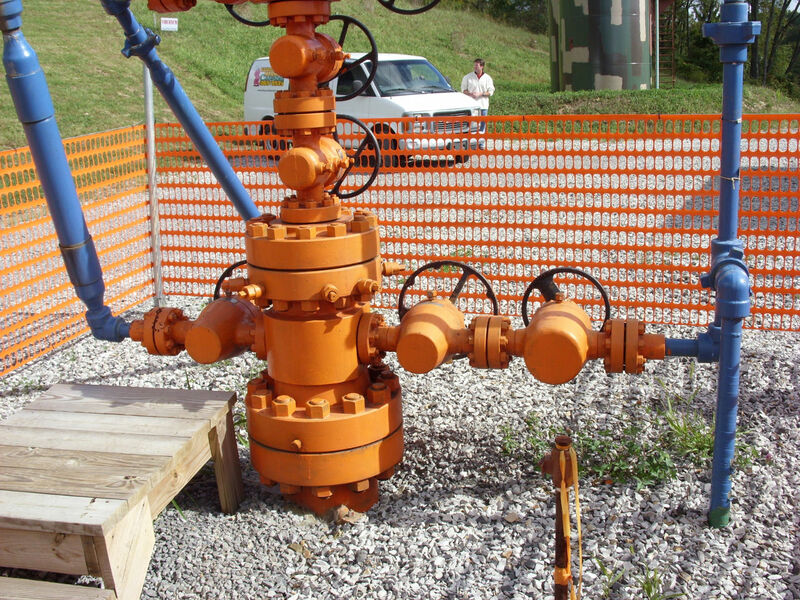 Known as a “Christmas tree," the piping and valves for well metering, as well as water/gas separation and initial gas dehydration equipment, are installed above grade. 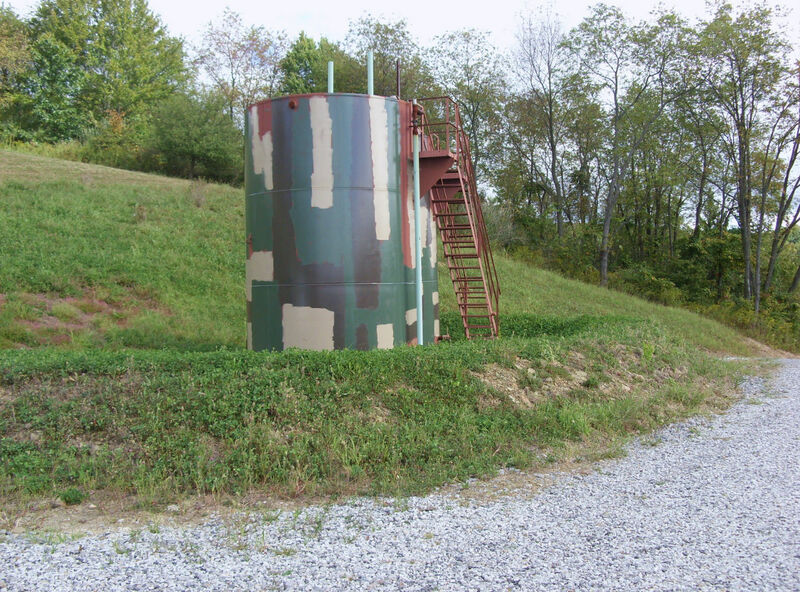 Above-ground tanks are also present to collect and store the brine liquids (produced water) found at great well depths and any oil retrieved from the gas well. Some concerned landowners work closely with environmental restoration companies and wildlife experts to return their production sites to an eco-friendly condition. Erosion, Sedimentation, and Stormwater Controls: Throughout the life of a well pad and any new access roads, the typical stormwater management concerns appropriate for any earth-moving project require design. These include topsoil stabilization, seeding, up-gradient diversion channels and down-gradient sedimentation basins, and filter fabrics or filter socks. These are particularly important during construction and development, until the well pad reaches its production stage. Fracture Water Management: The shale fracturing phase of well preparation requires large volumes of water, typically in the range of 4-5 million gallons per horizontal well. Prior to fracturing of the well laterals, frac water is brought to the site, generally via tanker trucks to be staged for the fracturing operations. Water tanks and trucks on the well pad are connected with manifold piping and hoses to truck-mounted pumps so that water and additives can be forced into the well bore at very high pressure. A water management plan must be implemented, particularly for the water returned to the surface following shale fracturing below. 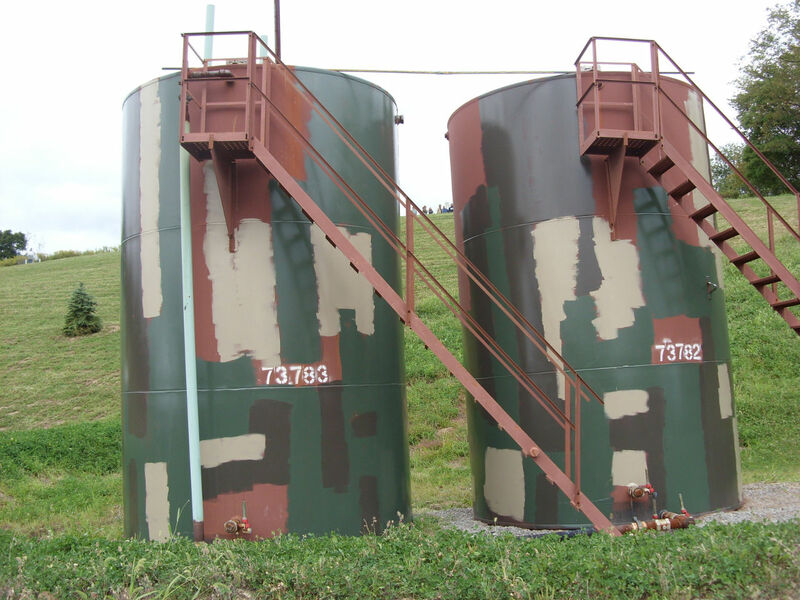 High-Density Polyethylene (HPDE) lined pits have been used to collect frac water, but there is a trend toward using storage tanks as part of a closed-loop piping system. Road Preparation or Upgrades: Stone aggregates are brought in bulk and placed on graded access roads to provide better vehicle movement. Where existing public surfaced roads are used to transport the drill rig, drill pipe and casing, sand, water, and other well materials, pavement thicknesses are often increased or resurfacing is provided to accommodate larger truck loadings where they are needed. Pre-construction surveys for land tracts and pipelines, gathering and transmission lines, and access roads. Sensitive environmental resource investigations, mitigation if necessary, and regulatory permitting. Infrastructure enhancements including bridge evaluation and upgrades for heavy truck traffic. This industry has not been without controversy. Claims in the news media allege that the fracturing process has caused the contamination of drinking well water and/or fresh-water aquifers with fracturing fluids, brine, or methane. The hydraulic fracturing activities in shale are very deep and potable water supplies are usually a mile or more above the shale zone, with numerous hard rock formations in between. Any potential for contamination of drinking well water or aquifers by fracturing is extremely remote. 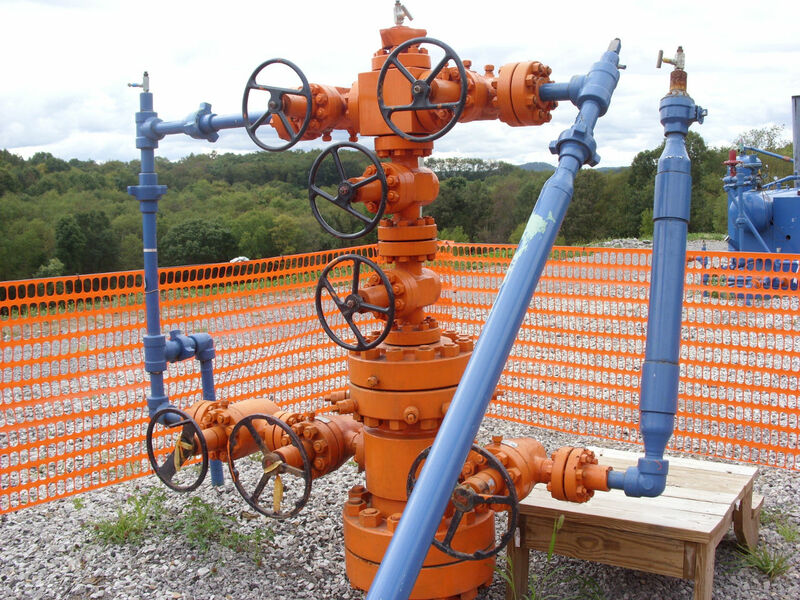 Counter-arguments have been made that the fracturing process creates new pathways for natural gas to flow up into fresh water aquifers thousands of feet above the natural gas well laterals. However, considering the thick intervening rock layers and the extreme pressures that would be needed to drive fluids thousands of feet upwards, it is highly unlikely such pathways could be formed. Along the Well Boring: Faulty cementing around the well casing in a well bored through the water table is a potential concern. Diligent cementing of the well casing above and through the depth of the existing aquifers is important to isolate fresh water from the well boring; regulatory agencies have been reworking their regulations to further ensure that cemented well casings are highly effective barriers. At the Surface On the Well Pad: Spillage or leakage of the drilling muds, fracturing additives, fuels for electric generators and vehicles, or brines and produced water from the well is a concern. These fluids are handled on the surface at the well pad during well construction, completion, and gas production below the aquifers. Separately, poor fracturing water or stormwater containment at a well site could result in contaminated water run-off that might migrate to a fresh water drinking supply. In light of these concerns, companies are improving their spill containment plans and practices, some even laying HPDE liners over the entire drill pad during the well completion stage. Many power plants that currently burn pulverized coal can be converted to natural gas. Such conversions are costly, but can result in air quality improvements. Compressed natural gas (CNG) vehicles are available, as are conversion kits. Fleet vehicle operations such as buses or taxis that return to a maintenance facility each day are excellent candidates for CNG. Technologies to convert natural gas to traditional liquid fuels such as diesel fuel and jet fuel are being implemented. Industrial plants that can process “wet” natural gas, which is gas containing long-chain hydrocarbons known as natural gas liquids (NGLs), are under construction or being planned throughout the western portion of the Marcellus Shale region. “Dry” natural gas can be sent directly into transmission lines after removing water and any hydrogen sulfide that may be present. New pipelines will be required to efficiently transmit either type of extracted natural gas from shale sites to gas distribution companies and end-users throughout the U.S.
“Midstream” natural gas industries -- those between the well pad and the energy consumer -- perform gathering, compression, and natural gas processing services such as dehydration. These activities and their associated infrastructure will have to increase with increased production. Natural gas production cannot be instantaneously adjusted for supply and demand. 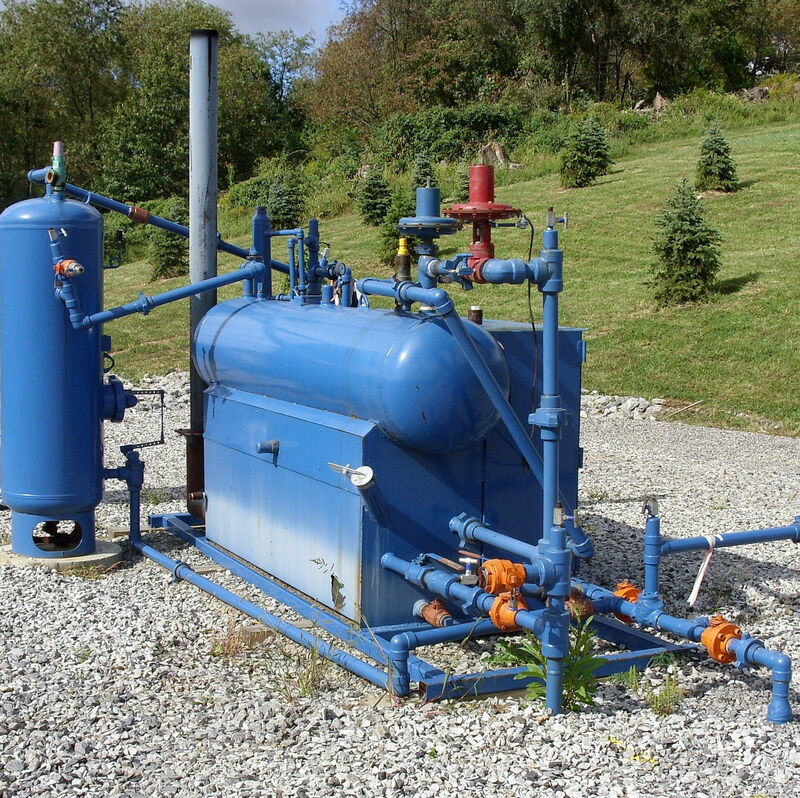 Many underground natural gas storage reservoirs have existed in the Marcellus region so that natural gas could be stored there for high winter demand. 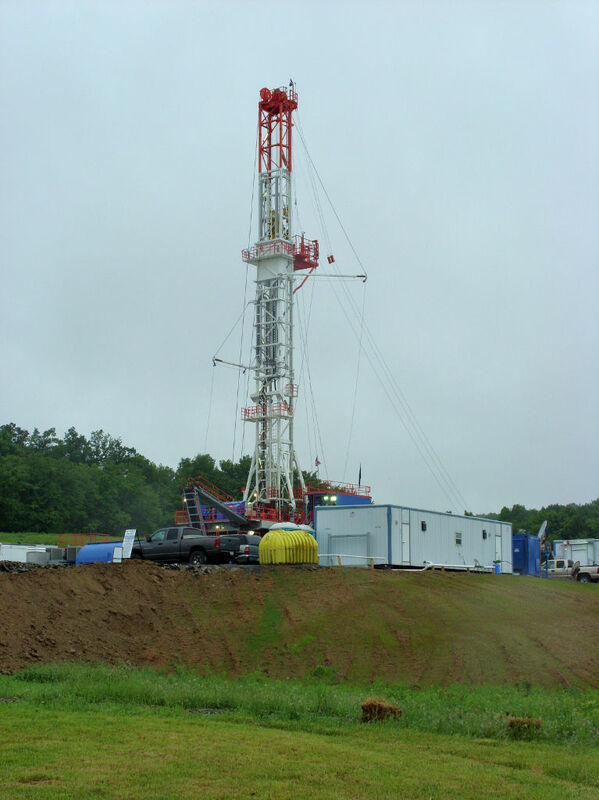 Many storage areas in naturally occurring geologic voids throughout the Marcellus shale region will be expanded. Efficient marketing of natural gas from America’s shale plays requires numerous engineering considerations. Increased reliance on our natural gas resources is sure to be reflected in the United States’ future energy and environmental (air quality) policies. Jim Daley, PMP, Director of Natural Gas and Energy Programs at Greenhorne & O’Mara, was a technical contributor to this feature.